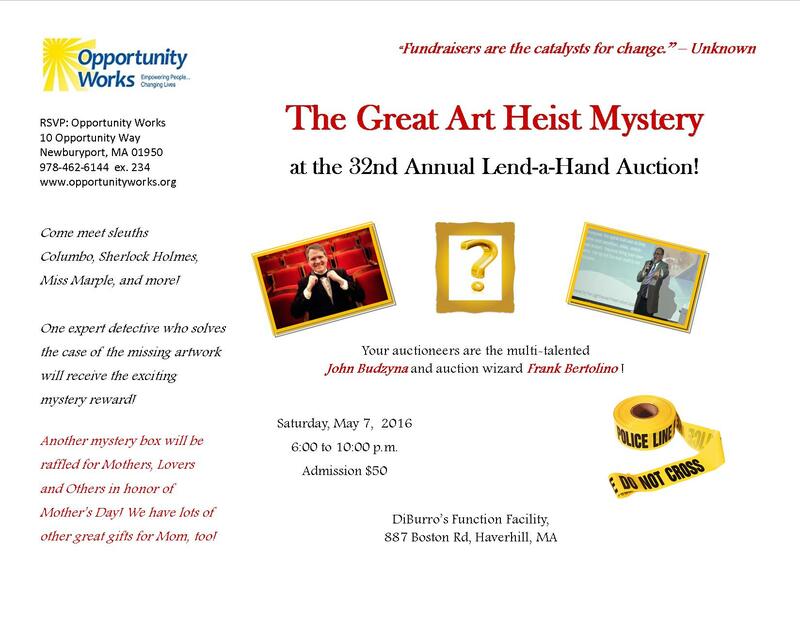 haverhillchamber.com | The Great Art Heist Mystery at the 32nd Annual Lend-a-Hand Auction! The Great Art Heist Mystery at the 32nd Annual Lend-a-Hand Auction! Opportunity Works is throwing a bash on Saturday, May 7, 2016 from 6:00 to 10:00 pm. The theme is the The GREAT ART HEIST MYSTERY! at the 32nd Opportunity Works Lend-a-Hand Auction! Our auctioneers/sleuths will be the talented John Budzyna and the auction master, Frank Bertolino! As a friend of Opportunity Works and supporter of adults with disabilities, we would like to ask you to serve as an ambassador for Opportunity Works and fill a table at the auction. We don’t ask you to pay for the table, but to invite your friends to buy tickets to join you at your table. Attendees love our events. They are so much fun and the items are very popular! This year the mystery of the art heist at the ‘Gardner Stuart Isabella Museum’ will keep amateur detectives on their toes and laughing out loud! We are hoping, with your help, to introduce new people to our events and organization. Tickets are $50 each or $45 each for people who reserve a table for 10.